The importance of submarine power cables has increased steadily in recent decades. The advent of offshore renewable energy requires export cables from wind , wave and tidal installations are needed to bring the renewable energy ashore. A report (1) published in 2013 advises that the UK economy could gain £6.7bn per year and 150,000 jobs by 2020 from the development of offshore renewable energy resources. Inter-connector cables are being laid to move energy freely throughout Europe, thereby ensuring security of supply (2). Being able to share energy between countries reduces the frequency and severity of high price spikes and smoothes the supply/demand timelines. 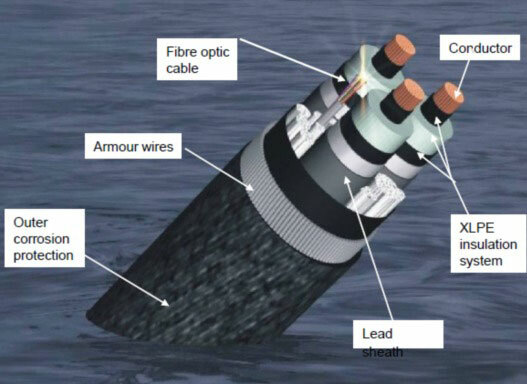 Submarine power cables can be anything from 70mm to, exceeding, 210mm in diameter and come in two flavours, AC or High Voltage AC (Alternating Current) and High Voltage DC (Direct Current). The selection criteria for which type of cable to use is heavily dependent on the route length, voltage, transmission capacity and Grid synchronisation. Typically for a route length less than 80km, AC would be the most economical system as it is the cheaper technology, but it is limited by the distance it can go. Longer distances have to be undertaken using DC technology. The use of higher system Voltages is also being introduced to extend the cable reach. cables, and are laid either as a bundle in a three core formation, or as three separate cables. The configuration of DC cables is dependent on the DC system. There are two main types: Mono-polar and Bi-polar. Generally speaking they consist of two conductors, either laid separately, bundled together or in a co-axial arrangement. In 1954 the world's first submarine HVDC Cable, Gotland 1, was installed. This was 98km long from Gotland Island to the Swedish Mainland and had a capacity of 20MW. This changed how the world thought about submarine electricity transmission as it was realised that it was now possible to connect to other countries overseas that were previously thought unreachable. Currently the longest inter-connector is the NorNed cable between Norway and the Netherlands. At 580km, it is the longest submarine power cable in the world, with a capacity of 700MW. However, the very latest cable technology has the potential capability of reaching up to 1,500km. Great Britain currently has four major electricity inter-connectors. 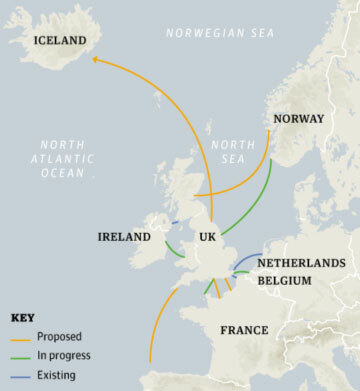 These link Great Britain to France, Ireland, the Netherlands and Northern Ireland. These links, total 4 gigawatts (GW), and represent around 5% of the UK's existing electricity generation capacity. In addition to the above there are numerous island power links and a further 5no. Large inter-connector cables planned. Unsurprisingly, cables are as central to offshore-to-shore power transmission as they are on land. All of those wind turbines are connected by submarine cables. Smaller cables run from each turbine to an offshore substation, the power is then transported over a higher capacity export cable to an onshore grid connection. In addition to offshore wind, power generated by offshore wave and tidal power generation is also totally dependent on submarine power cables to bring the energy on shore. The type of cable used will depend primarily on the distance from the shore. Many of the earlier inshore wind farms use AC export cables, whereas the larger wind farms further offshore will move to using HVDC cables. 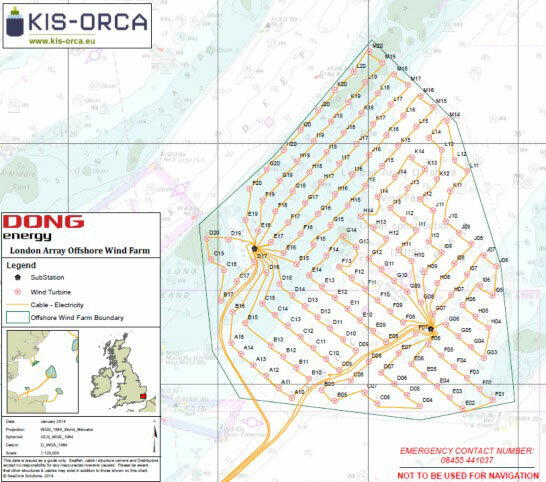 Offshore wind farms have been a feature around the British Coastline now for well over a decade. Loved by some, hated by others, they are here to stay and are essential for the UK's energy needs. There are currently eighteen operational wind farms around the coast of the UK with a total of 1,075 turbines. There are five more under construction, a further eight with planning permission and a potential of approximately another thirty in development. The UK currently has a power generating capacity of around 80GW, and during the winter has a maximum demand of around 60GW, this leaves a head room of 20GW. This sounds good, however, over the next few years the UK is going to lose 12GW of generating power from old coal fired power stations and 7.5GW of nuclear generating capacity is due to come to its end of life. To ensure the lights stay on we need to maintain a headroom above our maximum demand. New nuclear power isn't planned to come online until 2023 or later. So we must look to further offshore wind energy. In addition to the capacity already installed, a further 5.7GW is either in construction or has planning approval, and a further 12.3GW is in the planning system. Industry projections see a total of around 8GW of capacity installed by 2016 and around 18GW installed by 2020, by which point offshore wind will supply between 18 to 20% of the UK's electricity annually. Of course the only way to transport that power from the wind farms to the grid is via a submarine cable. An unfortunate reality of wind power generation is that it is, by its nature, intermittent (an availability ofbetween 40-50%,(3) compared to 82-92% for nuclear, coal, oil, gas). It is therefore necessary to have infrastructure that can respond to rapid changes in generating output. In order to meet any shortfall we would have to import energy from Europe via the existing and proposed inter-connector cables. However, when the UK's renewable installations are generating at full capacity, the UK will be able to sell its surplus energy back through to Europe over the same inter-connectors. 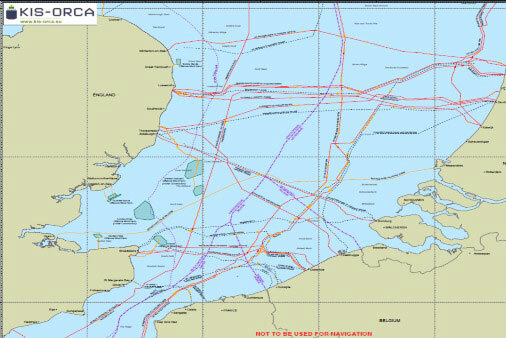 Subsea cables were often installed to sparsely populated islands with financial assistance from the European Union under Uneconomic Rural Development Schemes. Such projects provided electricity connection to new customers for the first time. Today, subsea cables are used to connect most European and UK islands to mainland electricity grid networks. Where there is a requirement to extend, upgrade or reinforce the network there may be a need to lay subsea cables. The majority of these distribution or transmission subsea circuits are AC cables at medium or high voltages of up to 132kV. 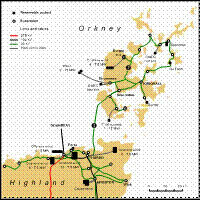 Electricity connections to many islands rely on single radial circuits and often replace old islanded diesel generation. Customer demand for increased power requirements and improved reliability and security of supply often require multiple circuits or interconnected networks. The cable is fed out of the rear of the ship and onto a plough that is towed, either by the cable ship or another ship following behind. The plough lifts a furrow of the seabed and the cable slides into this furrow, then after the plough passes the part of the seabed that was lifted, it is returned back to the seabed on top of the cable. In some cases it may not be possible to bury a cable. In these situations other methods of protection may be considered, such as covering with graded material or covering with modular protective units of polyurethane or concrete. 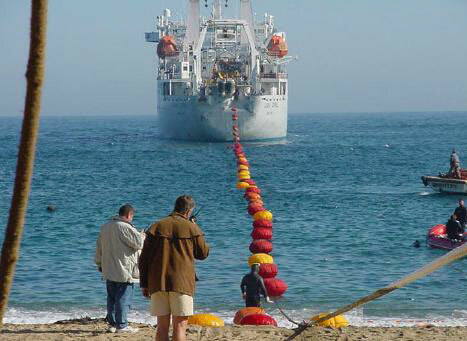 In some cases it may be that there is no need to protect the cable and it may be laid directly on the sea bed. 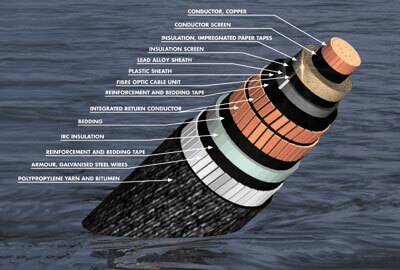 Submarine power cables are actually at most risk of damage during their installation. Stresses placed upon the cable as it is installed can manifest themselves immediately or many years later. Once Installed, cables are at risk of damage by fishing trawlers and ship's anchors. Cable owners combat the threat from fishing by using cable awareness projects such as www.kis-orca.eu, where cable information is freely given to fishermen across Europe in the hope they will avoid fishing over cables. Timescales to repair a submarine power cable can vary from weeks to many months, dependent on ship and cable availability. To repair a damaged cable it must be brought to the surface and be in two separate pieces. The two original ends of the damaged cable cannot simply be re-jointed together as there is not enough slack in the cable to allow this. Therefore a piece of stock cable is spliced into the original cable to connect the two original ends. Every time you repair a cable, you are making it a bit longer than when originally laid. The marine environment is very important. As a responsible marine industry the subsea cables sector does all it can to have a minimal impact on the environment. 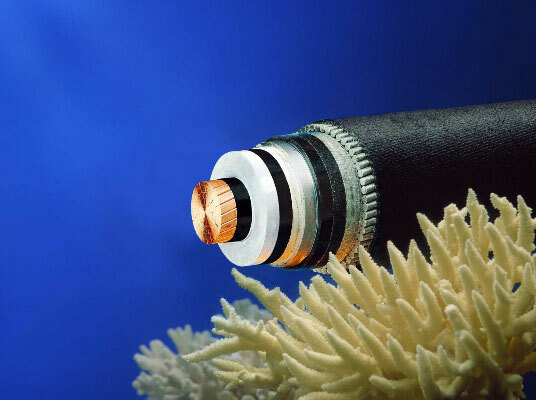 Submarine power cables are small in diameter. Any disturbance to the seabed is undertaken during installation, or repair, and affects only a narrow section. A number of recent studies to examine the environmental impacts of cables and cable laying suggest that the impacts are small or insignificant and only temporary as a result of cable laying. Other environmental concerns associated with power cables are centred around Electro Magnetic Fields (EMF) and thermal temperature rises. However, studies (5) show that EMF effects are negligible and that any potential thermal changes are impossible to detect against natural fluctuations. Submarine Power cables are critical to bringing on shore Europe's renewable energy; they will be central to sharing energy across Europe to ensure availability of supply, and they can do all this without having an impact on the environment, something which is essential in creating a sustainable future for the ever busier world. 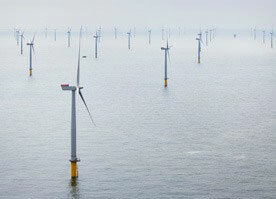 (1) Generating Energy & Prosperity - Offshore Renewable Catapult, March 2013. (2) EU Reg No 1316/2013 Connecting Europe Facility (3) Data submitted by London Array & Walney OREI. (4) General advice on assessing potential impacts of and mitigation for human activities on MCZ features, using existing regulation and legislation, June 2011. (5) Britned, 2014, Neart na Gaoithe Offshore Wind Development, March 2013.